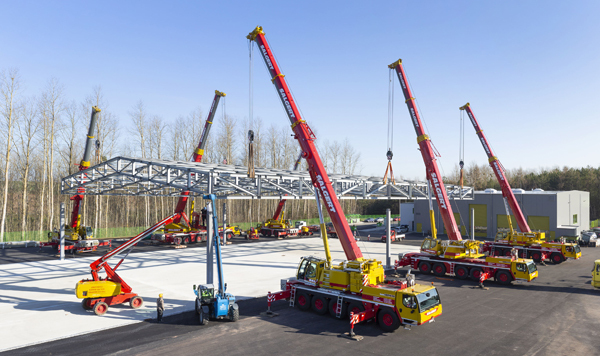 Heavy haulage contractor Salgert used six Liebherr mobile cranes for the roof construction of an industrial building near Mechernich, Germany. 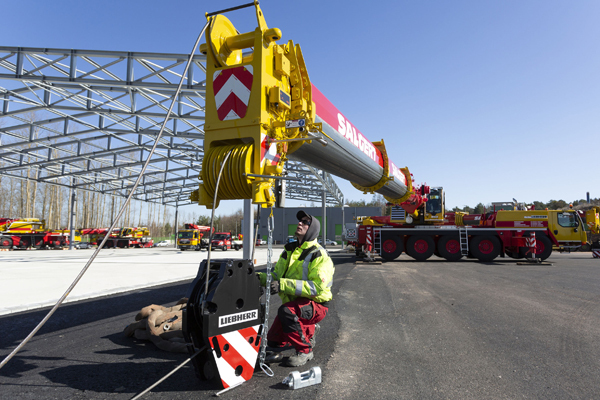 Half of the cranes used on the site came from the group's headquarters in Lohmar, whilst the other three travelled from the Salgert branch office in Euskirchen. The group of cranes had lifting capacities from 90 to 300t, with an LTM 1090-4.1 the smallest crane and an LTM 1300-6.2 the largest. Among the cranes used was the company’s latest addition, an LTM 1095-5.1. When the load had been raised around one metre, it was the turn of the structural steel workers. An extension section measuring around 75cm was placed and bolted to each of the six pillars. The precise lowering of the roof afterwards was then completed professionally almost as a matter of routine. Just four hours after the arrival of the yellow and red vehicles on the site, the job had been successfully completed. All the mobile cranes had their telescopic booms extended around 25m and a gross load of around 25t each on their hooks.